Never mind I'll find salmon like you. This is a great healthy dinner option. 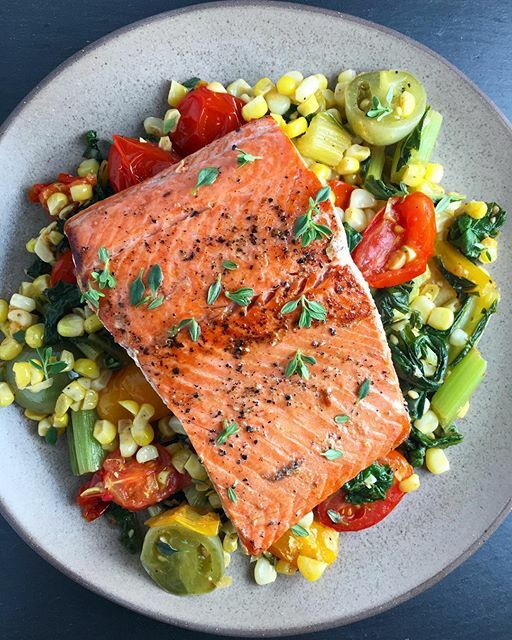 The tomatoes, chard and corn pair so nicely together and taste like summer in a bite. This recipe is featured in our weekly Meal Planner. Sign up here to have 7 great recipes delivered to your inbox! Saute chard with 1 1/2 cup corn kernels in a saute pan with 2 T olive oil until tender, 5 to 6 minutes, add cherry tomatoes and cook for 2 more minutes. Season with salt and pepper, then keep warm. Heat remaining olive oil in a large nonstick skillet over medium high heat, add salmon fillets (seasoned with salt and pepper) and cook flipping once until the fish is medium rare and golden, 3 to 4 minutes per side.